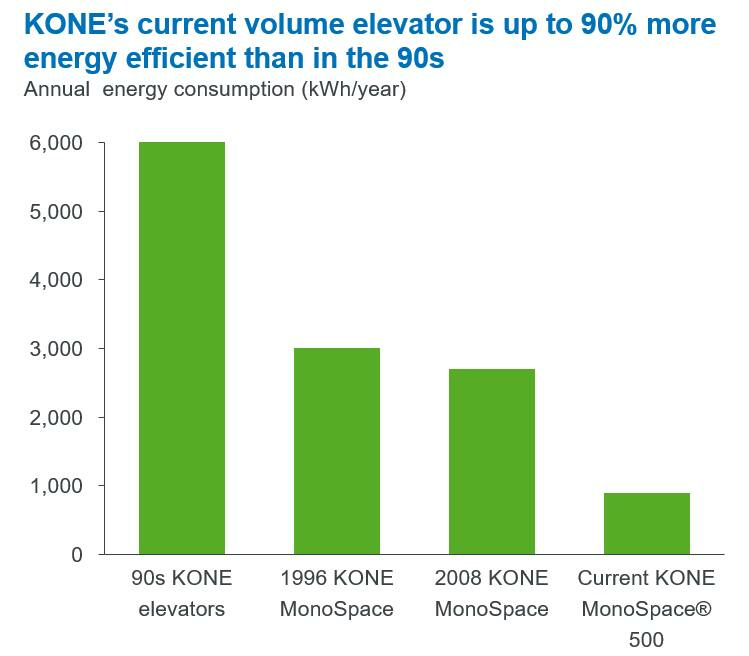 Sustainability is a source of innovation and a competitive advantage for KONE. One of our strategic targets is to be a leader in sustainability and we strive for continuous improvement in all our business activities. Our sustainability focus areas include driving innovation and improving resource efficiency, providing the most sustainable offering, being the best employer and attracting talent as well as enabling our partners and societies to prosper. At KONE, we believe that sustainability is a source of innovation and a competitive advantage for us. Conducting business in a responsible way with good corporate governance supports us in creating long-term value for shareholders. For the elevator and escalator industry, urbanization is an important megatrend and also an opportunity to help make cities better places to live. As today’s cities account for 75% of global energy consumption and buildings constitute 40% of it, by providing eco-efficient solutions to buildings KONE can help reduce cities’ impact to the environment. With breakthrough technologies such as the KONE MonoSpace 500 and UltraRope, a superlight hoisting rope, KONE is an industry pioneer in developing eco-efficient solutions. The installed base of elevators and escalators is aging rapidly, especially in Europe and North America. By modernizing elevators installed in 1985 or earlier with the best available technology, energy savings of up to 63% can be achieved (Source: Energy Efficiency of Elevators and Escalators (E4) study supported by the European Commission). KONE’s sustainability reporting follows the Global Reporting Initiative’s (GRI) G4 guidelines. KONE’s Sustainability Report 2017 was published in April 2018. KONE’s greenhouse gas emissions and water consumption at KONE's manufacturing units disclosed in the report have been externally assured. KONE’s Annual Review 2017 also contains information on ESG topics such as non-financial risks and risk management. In addition, KONE is an active participant in organizations developing codes, standards and guidelines for improving safety, accessibility, energy efficiency, as well as other organizations advancing sustainable development.